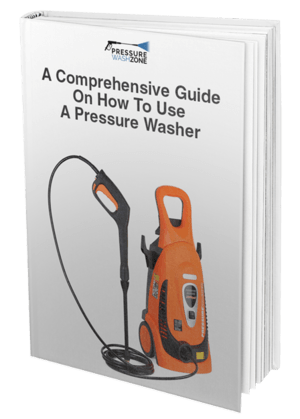 Want to get the most out of your pressure washer? Well perhaps, you should start using soap. You can drastically speed up the cleaning process by using detergents, soaps and other cleaning agents. Pressure washers are handy cleaning tools that can be used for a variety of cleaning tasks. These machines allow you to clean grime or dirt off common garden or home items. This includes patio furniture, vehicles, boats, driveways and more. 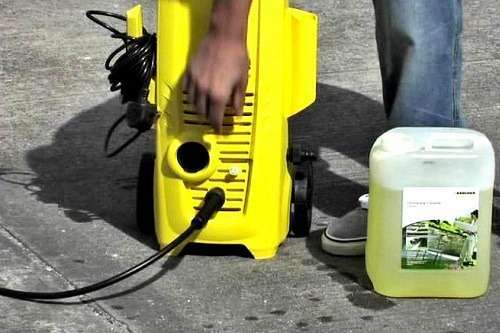 Pressure washers are powered by either gas or electricity. However, to obtain the best cleaning results, it is imperative you invest in a quality soap or detergent to make the task easier. Soap is a type of detergent that is made using natural products, such as fats and oils from animals and plants. The raw products are mixed with salts and processed down to glycerin and fatty acids with steam, which eventually results in soap. Liquid soaps typically incorporate potassium whereas bar soaps use sodium as a salt. On the other hand, detergents are made from chemicals and not natural oils or fats. Detergents are ideal for washing clothes whereas soaps are best suited for getting rid of natural stains. Soap, when mixed with water, is able to dissolve and break down stains, dirt and debris, wiping the surface clean. Should I Use Soap Or Detergents? Soap is a biodegradable substance and can be washed down storm drains without worrying about chemical contamination. However, it is best not to use soap with un-treated, hard water since it will combine to form calcium carbonate. This can leave behind traces of solid calcium carbonate on the surface. On the other hand, detergents are formulated to be more effective on surfaces, such as wood and concrete. Unlike soaps, detergent does not leave behind any residue. Synthetic detergents and natural soaps often combine to form an effective cleaning solution. 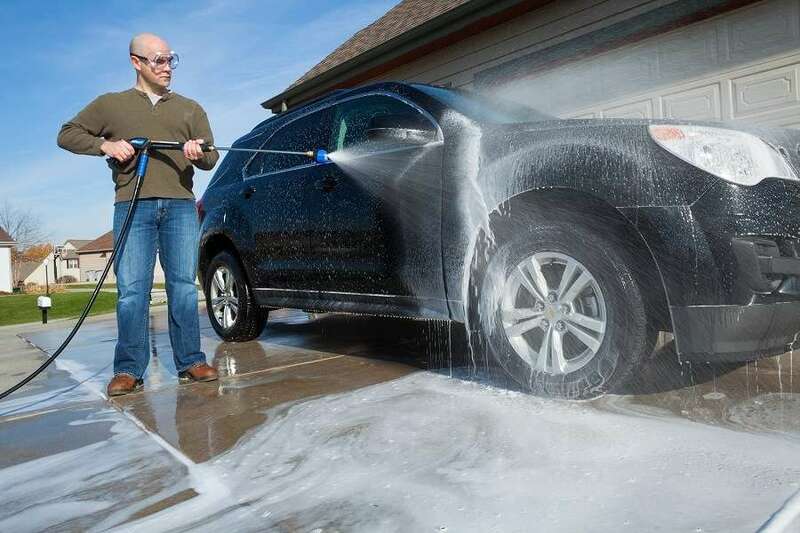 Pressure washer soaps and detergents can be annoying to restock, especially if you frequently use the machine to clean your driveway and patio. Detergents and soaps are for getting rid of permanent stains and preventing problems, such as lichen and mold. 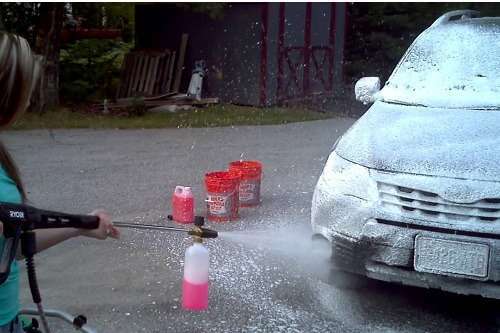 Consider making your own DIY pressure washer detergent at home. In order to get started, mix both powdered detergents together. Combine 2/3 cups of household cleaner with 1/3 cups of powdered laundry soap in a large bucket. Mix the detergents together with a wooden stirrer and leave overnight. Now, it is time to wear your safety glasses and face mask. In a separate bowl, mix 4 cups of liquid bleach in a gallon of water. Continuously stir the mixture and do not allow the contents to settle at the bottom. Keep stirring the mixture but do not move the spoon too hard or too fast. Stirring in the detergent too quickly will result in a mass of bubbles. If the mixture has too many air bubbles, leave it to rest overnight to allow the bubbles to disperse. How Do I Use The Detergent? Before using your DIY detergent, make sure to cover vulnerable surfaces and plants with a plastic tarpaulin to prevent the bleach from corroding or damaging the material. Cover vulnerable surfaces even though you are using diluted bleach. Once you have safely covered the surrounding areas, pour the detergent solution into the tank of the washer. Use the pressure washer to spray over the surface with detergent. Allow the liquid to penetrate in the surface. You can now use clean water to rinse the surface clean. 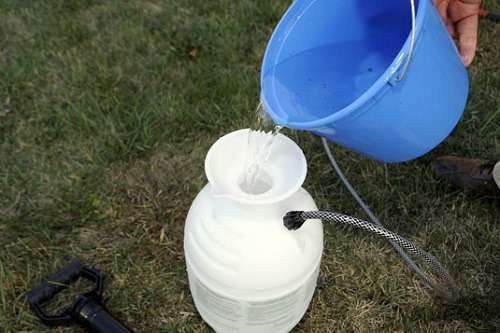 Once you have made DIY pressure washer detergent, consider storing it in a safe place if you won’t be using it too often. 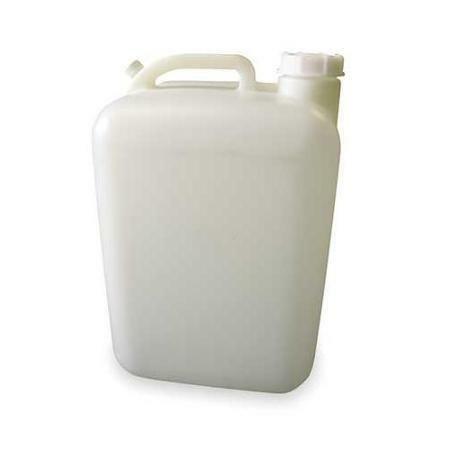 Use a milk jar or an empty fuel canister to store the liquid. Make sure you label the container properly and store it in a secure space, away from children. Before you use the mixture again, use a stirring spoon to mix the contents back together again. The detergent will last a couple of days or months, depending on your usage. Browse through several DIY pressure washer soap and detergent recipes online if this one doesn’t suit your needs. Where Can I Use Pressure Washer Detergents? Pressure washer detergents can be used on a variety of surfaces, such as garage doors, windows, concrete walls and vinyl sidings. You can also use DIY soaps and detergents to clean gates and fences made from metal. Before you begin scrubbing away, it is imperative you prep the surface. To do so, pre-wash the surface using hot water. Hot water loosens dirt molecules, making it easier for you to clean stains. If you are going to use the detergent before spraying water, allow it to sit for a couple of minutes. Add more detergent if you think the surface needs a larger dose. Use clean water to rinse the surface afterwards. Making DIY pressure washer soaps and detergents is a simple way to save money. Not only does this allow you to cut costs but it also prevents damage to surrounding materials and plants nearby. If you are investing in commercial-grade pressure washer soap, ensure that it is designed according to the surface you intend to clean. You will find a variety of soaps and detergents available in the market hence carefully select one according to your needs. Good luck!